People who live surrounded by squalor will act accordingly. It is no coincidence that the 300 block of Broad Street, Providence, is infested with people who panhandle, shoot heroin, drink until they drop and create an atmosphere of decay by their very presence. We tolerate it. That we do so condones the behavior of the people who congregate there, and other places where it appears that society has given up. The rescue unit of the Providence Fire Department bears a lot of the brunt of the illusion of clean-up, gathering drunken men and women who have passed out on the sidewalk dozens of times a day, every day. Overdoses in area businesses’ restrooms are an everyday occurrence as well. People urinate on the street, throw their empty vodka bottles wherever they wish, drop Styrofoam food containers next to trash barrels rather than in them and appear to the untrained eye to be litter themselves. Civilized society lets it go. We take the people who use Broad Street as their personal dumpster and playground to the hospital for detox when they have had their fill of alcohol, or observation until the heroin leaves their system and they re-congregate right where we found them, the 300 block of Broad Street. The police look the other way as we scrape them off the street and get them out of the public eye. I do not blame the police patrol officers: They follow orders. Still, I’m not quite sure what those orders are, but they cannot possibly be to let certain members of our society blatantly break the law, and then be treated with kid gloves by medical professionals. Make no mistake, these people are breaking the law, and their ability to do so undermines everything that holds our society together. Tolerating discord and lawlessness from a certain segment of civilization while the rest are expected to uphold the laws of the land is a recipe for disaster. The total absence of respect toward the authorities and the citizens who fund and let the lawlessness continue unabated is exactly what we deserve for letting it begin in the first place. The toleration of disrespect condones it, lets it fester until not only those who have given up on themselves feel free to behave in a manner inconsistent with civilized norms, but also people teetering on the edge of respectability or despair lose their moral compass as well. Real progress needs to begin — and begin now — before it is too late. Central High School and Classical High School are right around the corner from the display of daily debauchery. The kids spend all day learning science, mathematics, civics and history, and then are led into the real world when the school bell rings, and they return to their real lives and daily routines. They trip over drunken people, share bus stops with addicts, dodge rescues sent to “treat and transport” the same intoxicated people who were transported in front of them on their way to school, and sift through the littered streets toward their way home. The lessons with the most lasting impressions are not the ones taught in the safety of their classrooms. When it is considered okay to live on the streets, and act like an animal with no repercussions, eventually the desire to take responsibility disappears. We can beat them. We have to beat them, because it is not just themselves that are being destroyed, the very fabric of the city is at risk. Start small. Arrest the intoxicated people, if not where they dropped, then at the emergency room when they have sobered up, and have them spend the night in jail, and then the next day make sure that they are arraigned at court. Fine people for littering. Do it every time. When they do not pay their fines, issue a bench warrant and arrest them. Don’t let the junkies off the hook. Maintaining a narcotic nuisance means nothing to them, but keep arresting them, and continue to pursue the upper-level dealers. But in any case get the ones we can see off the streets, and the “upper-level” dealers will soon have nobody to sell to. Litter. Drunks. Junkies. Graffiti. Clean that up and things will begin to improve, I guarantee it. A workplace populated with workers whose initiative, productivity and satisfaction have eroded slowly and relentlessly since the economic downturn began in 2008 is a dismal place. The human spirit is remarkably resilient, but without nourishment it will slowly sputter, flicker and die. Without hope and reward, a person runs the risk of becoming a drone, not living but existing, filling his or her days with duty rather than initiative. A dutiful worker will perform his or her job but little more, without the hope of recognition, either monetarily, or in a more fulfilling way, through the pride that comes from doing a job well. Pride and dignity are not for sale but easily obtained, derived from one’s own self-worth. Job satisfaction is vital for workers, employers and the economy. A worker who believes he is “lucky to have a job” is not lucky at all, but in dire need of change. The only thing we can control as individuals during these times is our own mindset, and a good a place as any to start is at work. People who say they are lucky to have a job have either been brainwashed and beaten down by the present state of the economy, and manipulated by the near mythical “job creators” into actually believing that their job, their means of survival, their contribution to society and the very essence of self-worth, is a product of luck. Their uncertainty about the future and their ability to find work fuels the machinations that lead to a culture’s decay. A population beholden to people who control the nation’s wealth, energy and commerce is doomed. Say it. Believe it. Make it true. Be on time, be prepared, learn everything possible about whatever it is you do; be a great cook, clean as well as you can, write well, teach well, drive well, and be well. Some people are actually fortunate to love what they do. Most of us are not. That is no reason to fail to excel at work, and no reason to go through your days content to just get by, put in your time, cash your check on Friday and tell yourself you are lucky to have a job. Luck does not exist. Luck is a myth. Work is real, and good work a valuable commodity. This economy is not going to right itself. If we, the people who power it, are not healthy, productive and confident in our abilities and worth, mediocrity will rule. We will be a country full of mediocre people doing mediocre things for mediocre wages, as the world that generations of hardworking, productive people have built crumbles into a pile of mediocre things that nobody wants. The power of one person who believes in himself or herself cannot be understated. We can’t all own the companies that employ us. Everybody can’t be the boss. Most of us have to do the work that keeps everything going. Every person who contributes is vital. So stop telling yourself that you are lucky to have a job, and start believing that your job, or the job you seek, is lucky to have you. Why would the director of Crossroads Rhode Island, which serves the homeless, get involved with the political maneuvering, wheeling and dealing and certain backlash from supporting a group called EngageRI, whose primary purpose was lobbying the General Assembly to pass the controversial Rhode Island Pension Reform Act? What, if anything, was to be gained by convoluting the political process needed to iron out the necessary details of the plan? The board of directors of Crossroads is a Who’s Who of Rhode Island. State Treasurer Gina Raimondo sits as the vice chairwoman, between Ed Handy, the president of Citizens Bank, and Edwin Santos, the president of CharterCARE Health Partners, and near U.S. District Judge John McConnell Jr.
Executive Director Ann Nolan, who earns $150,000 a year working for these folks, chose to do what is best for her by supporting her bosses and joining EngageRI. EngageRI’s board includes: Ed Cooney, senior vice president of Nortek, Inc; Constance Pemmerl, retired financial executive; Ted Long, partner, Holland & Knight; John Galvin, chief financial officer, Collette Vacations; Paul J. Choquette Jr., vice chairman, Gil-bane Inc.; Susan Arnold, CEO and general counsel, Rhode Island Association of Realtors Inc.; Kas DeCarvalho, partner, Fontaine, DeCarvalho & Bell; Brad-ford S. Dimeo, Dimeo Construction Company; James Diossa, councilman for Ward 4 in Central Falls, Michael McMahon, founding partner, Pine Brook Road Partners; and Dan Sullivan, CEO and president, Collette Vacations. Two sides of an issue are best understood by having opposing viewpoints explained and supported by groups or individuals from either side. Business leaders feel they have a bigger stake in the pension crisis than the average citizen, and they formed a coalition to have their voice heard in the General Assembly. Labor organizations, whose members were directly affected by the legislation, had their leaders representing their interests during the debate. Crossroads joined the debate, siding with business, and by doing so jeopardized a vital part of its income stream: charitable contributions from middle-class working families. Somebody blew it, and made a mockery of Rhode Island’s pension system. Who is at fault, and how best to fix the mess is not, never was, and never will be the concern of the director of Crossroads Rhode Island, at least not in her official capacity. The outrage sparked by a call for members of labor unions to cease supporting Crossroads and other community support groups that got involved with EngageRI should be aimed at the directors of those groups, not members of the state’s labor unions who have always paid their dues so that they can have a voice in government. Crossroads does not pay its dues. It depends on donations. When leaders of charitable organizations feel they have a voice in the fiscal policy of the state, and subject people who depend on services of those organizations to hardship as a result of their quest for personal power, nobody wins — not the state’s business community, the middle-class workforce nor especially the people whose lives are most affected by what Crossroads is supposed to offer — non-judgmental assistance to those who need it. Twenty years ago I thought I would do this job forever. I had a dream: work in Providence till I was 60 and they threw me out, and then move to somewhere where they have a volunteer fire department and put my experience to good use. The department offered a 50 percent pension after 20 years, we contribute 9 .5 percent of our pay toward the fund, and the city contributes the rest. “That’s nice,” I thought, never considering that I would actually leave after 20. Time marches on, and 20 years passed in the blink of an eye. The person I was when I started is long gone; a different, more somber, at times cynical person has taken his place. People who walked in my shoes fought for the 20-year pension deal, knowing from experience that 20 years in firefighter time is a long, long time. They knew, as only one who lived the life will ever know, that for some, 20 years is enough. They knew that at 45 or 50, starting a new career is not that easy, or starting a business when everybody else had a 20-year head start is challenging, to say the least. I remember sitting in at a critical incident debriefing a few hours after I held two dead infants in my arms. My latex gloves melted into their skin their bodies were so hot as I tried unsuccessfully to revive them with my new CPR skills. I bagged the one-year-old — Savannah was her name I found out later — while doing compressions on the other, John. It was rough, but it was what I had signed on for. The guy who brought the babies from the fire to me was a 20-year veteran firefighter, a tough guy by all accounts. When it was his turn to speak he filled with tears, and couldn’t. He hung his head and valiantly tried to express his feelings, but couldn’t. He left the room. A few months later he was gone. Retired. He told me much later that it wasn’t necessarily that call that did it; it was all the calls leading up to and including that one that finished him. He simply could not do it again. I should have learned a lesson that day, but mired in the arrogance of youth I hadn’t lived enough to sense my own frailty. I was invincible. I thought of him the other day, as I drove home from what I thought was an unremarkable tour. As I neared my street, I thought of the little girl who claimed to have injured her knee and refused to move from the gymnasium floor. Her mother looked on from a distance, annoyed as I tried to figure out what was wrong. No bleeding or deformity, swelling or anything really. She showed me her other knee as a comparison, and I noticed bruises, weeks old on both legs, and both arms, and a haunted look on her face. I let it go. We can’t save everybody, and she probably is just an active kid who bruises easily. Or not. I turned onto my street, and had to stop the car. Where was the little girl now? Was she home, in her room, reading or watching TV, or was she being punished for being a crybaby, like the kid a few weeks ago whose mother called us because her son “fell” from his bed — fell and had severe head trauma and curling iron burns on his legs. It took 10 minutes for me to pull myself together before I could walk in my door and not bring 20 years worth of memories with me. I haven’t been sleeping well. It’s been going on for months now. Every night that I’m home I’ll go into a fitful slumber around midnight, only to be fully awake at around 2 a.m. I toss and turn for hours, finally getting some relief from my spinning mind at sunrise, only to be back up an hour later. I grab an hour here and there as time permits but have no idea what a full night’s sleep feels like, unless it is drug-induced, but I try to avoid that. What runs through my mind is probably similar to every other person my age — are the kids really okay, will the bills get paid, am I truly happy or is this just an illusion, is that spot on my back the cancer that will kill me or just a mole. Then I get the ghosts. • The baby run over by the 18-wheeler as it turned the corner on North Main and Doyle, dead in the middle of the street, the baby carriage twisted and crushed 100 feet from the body. • The guy buried alive at sunset on Dorothy, and his lifeless arm that was the first thing we dug up. • The 18-year-old tattoo artist found hanging in his basement by his roommate. • My friend’s brother found hanging in his bedroom closet. • A RISD student found hanging from the wrought iron fence at Prospect Park. • The kid found hanging off the side of his house on New Year’s Eve. • The 55-year-old who told his wife he was going golfing, started his car, didn’t open the garage door and died next to his clubs. • The 40-year-old who held up traffic while he considered jumping from the overpass, then did as the crowd that had formed cheered. • The college kid who fell 80 feet to his death the week before Christmas. • The baby who rolled himself into his blanket and suffocated, while his dad was napping on the couch. • My friend Kenny who had a heart attack at his third building fire of the day, and had to be defibrillated, and came back to life but not the job. • The 17-year-old girl who bled to death in the front seat of a car that had struck a tree while eluding police as her friends picked her pockets of the crack vials they were selling. • The baby born dead and put into a hefty bag. • The woman dead in her kitchen with a bullet hole in her forehead and her three children sitting on a couch in the next room. • The two babies that broke the veteran firefighter. • The eight-year-old deaf girl who broke my heart when I learned she had been prostituting for her foster parents. • The 20-year-old dancer dead in her car after taking all of her pills, and the vomit-covered note on her lap. • The family dead behind the front door as the fire burned out of control behind them. • Delivering a baby in the back of the rescue and having the mother yell get that thing away from me when I handed it to her. There are dozens, hundreds more, all waiting for that delicate twilight between sleep and consciousness to come uninvited into my mind. More join the parade every day that I come to work. Just the other week a 23-year-old hit and killed while walking home from a nightclub, a 30-year-old guy shot in the head, back and legs who walked to the rescue and then collapsed. I am not a machine. I am a simple person who signed on to do a job, and have done it well. If I choose to leave this year, I will do so with my head held high, and hope that the pension that didn’t matter to me 20 years ago, but has become my lifeline, is still there. The accident was horrific. Seasoned firefighters, EMTs, nurses, doctors, police officers and Rhode Island state troopers who responded carried the images with them throughout that weekend, and will for a long time to come. My shift started an hour after the crash. The after-effects lingered in the firehouse, the emergency rooms and the demeanor of the first responders. Our thoughts and prayers are with 9-year old Alexis Silva, who died instantly in the accident, in Providence, on Saturday, Sept. 25, and with her family. Shocked and grieving family members needed help as the hours progressed. They gathered in small groups at the emergency rooms (people in the accident were transported to Hasbro and Rhode Island hospitals), mixed in with the usual assortment of drunks, assault victims and emotionally disturbed people. Some were overcome with grief and became patients themselves. We did all we could to lessen their suffering. I’m proud to be part of the emergency-response community, whose actions following the tragedy were, as always, everything they could be. It was gruesome and heartbreaking. We did what we are supposed to do: We held the community together, and put ourselves aside until later, when the crisis had passed. Those who knew Alexis decided to hold a makeshift memorial of sorts at the accident scene. These tributes, while well-meaning and possibly helpful to the family, have become a very bad idea. Dozens of vehicles and hundreds of mourners gathered on the shoulder of Route 10, endangering themselves and people not directly involved. There are laws against pedestrian traffic on highways for a reason. A different patient from a different accident was in the back of my rescue, wondering why we had stopped on the way to the hospital. “Traffic jam,” I told him, as I looked out the side window at people milling around the highway. One of the mourners was overcome with grief and needed another rescue, which was delayed because of the traffic generated by the memorial. I couldn’t believe that, of all the people who drove to the accident site, and parked their cars on the highway, not one had the sense to say that perhaps this isn’t a very good idea. Later another group of people stopped at the site to mourn, stopped their car, got out and walked away, forgetting to put the vehicle in park. Their car rolled, driverless, across the highway, into the opposite lanes of travel and across those lanes. It is a miracle that nobody was killed. Had they been less lucky, the person or persons who died would be just as gone as little Alexis, and their families just as devastated. Memorializing the place where a person lost his or her life may be helpful to those who are left behind, but at what cost? Their memory resides in the hearts of the ones they loved, not on a litter-filled roadside. We all mourn and remember in our own way. I hope the trend of accident-site memorials goes away before anybody else dies needlessly. We love to eat. We love to cook. We visit the markets, familiarize ourselves with the district, interact with the people we are paid to protect and contribute to the local economy. It’s one of the many great parts of the greatest job in the world. Generations of firefighters have shared the experience of gathering around the table and breaking bread. Mealtime seldom goes smoothly, the job comes first — always. Many a masterpiece has sat on the dinner table, going cold, getting stale and dying of loneliness as the intended benefactors of the feast are occupied elsewhere. The meal is always a risk, but one well worth taking. It goes with the territory, and we all know it. Showing up for work is a risk. You just never know. In bigger firehouses, those with two or more fire/rescue companies, the cooking duty is rotated among the crews. Whoever is responsible for the meal simply adds that job to the normal routine. In between station maintenance, vehicle maintenance, personal maintenance, training and, of course, the emergency calls, shopping for and preparing lunch or dinner for the crew is accomplished. We go together. From the moment we “relieve our man, or woman,” we are part of a team. The apparatus is only a tool, the people assigned to it make up the company. In an ideal situation, company integrity is never compromised. If three firefighters are assigned to a piece of apparatus, then three will be ready willing and able to go at all times. Some companies have four, or five firefighters assigned, or, in some cases, only two. Whatever the number, we go together and work as a team. And train as a team. And do our job, always the job, as a team. We shop as a team. We take the truck. We park it in the store’s lot, and go in together. If we are needed, we drop everything and go. The truck is never more than 30 seconds away. Luck is a fickle thing. Sometimes when a call comes in, we are actually in a better position when responding from wherever it is we are rather than directly from a fire station. This could be a store or a training ground. You just never know when or where we will be needed. Responding from a store or the highway doesn’t matter much. What does matter is that we are ready. And we always are. When we are called away, the folks at the store put our stuff aside and wait for us to come back. Sometimes it only takes a few minutes. Sometimes it will be hours until we return. But we always return, and pay for our food. If the bill is $40, and there are 10 people to feed, we pitch in $5 each. The extra is put aside, when it hits $100 or so we make something special. Those meals are normally saved for Christmas or Thanksgiving or Fourth of July. If you happen to be working on your birthday, you might even get a cake. It’s nice to share a nice meal with your second family on the holidays. It makes being away from home bearable. More times than not, a positive outcome is achieved. Once people understand the tradition, camaraderie and civic responsibility that mealtime in the firehouse promotes, the uproar dies down, the politicians and chiefs let their people back into the community and harmony is restored. A few bad apples only ruin the bunch for a little while. And sometimes, those rotting apples can make a pretty good pie, as long as you get them before they go completely bitter. THE BLINDS were separated, leaving an inch of blackness between them. Somewhere in the darkness two eyes looked out. They saw me but I couldn’t see them. We stood on the snow-covered doorstep. No sounds came from inside. I knocked again. Nothing. “Rescue 1?” my portable radio cracked the silence. A disheveled, intoxicated 30-year-old female opened the door widely, begging us to come in and shut the door. The place was in shambles. Dirty dishes, laundry, spent cigarette butts, animal waste and cockroaches had taken over. The patient scurried about, pretending to tidy up the place but in actuality couldn’t have tied her shoes at this point. She was too far gone. “Rescue 1, do you need the police?” the radio blared. The Fire Department is called for a variety of reasons. Nestled among the building fires, chest pain, intoxicated persons, building collapses, car accidents and other emergencies are a surprising number of calls for psychologically unstable patients. The labels vary: Emotional, Change of Mental Status, Anxious, Suicidal, but all are potentially dangerous. Society is filled with people suffering from emotional and psychological problems. Many of these folks lead productive lives once they get help from remarkably effective treatments; medication and other therapy produce tangible results in the mentally ill. Some patients have given up on treatment, choosing to make their own way in the world unimpeded by modern medicine. Most are not successful. Many have no access to the health-care system. Whether that is their own decision or beyond their control is irrelevant, what matters is there are a lot of untreated mentally ill people living among us. When crisis occurs, and if they are able to recognize the warning signals their damaged minds send out, a good resource is the 911 system. Highly trained personnel are waiting to take care of these patients, and get them the help they so desperately need. Or are they? Those in emergency medical services are given rudimentary training regarding the mentally ill. They cannot solve their problems, nor do they have the qualifications to try. The best they can do is to keep patients calm and get them to the help they so desperately need. Sound simple? It’s not. Those who decide to call for help are at the end of a long, downward spiral. Making that call is a courageous step, fraught with uncertainty. They wait by the phone, wondering if they did the right thing by calling. From the time the initial call is made to the time help arrives a lot can happen. They can change their minds. They can hear voices. They can begin to see their rescuers as threats to their independence. At times, violent struggles ensue. Sometimes the situation is diffused with care and compassion. Often, force must be used. But whose responsibility is it to use force? The majority of calls for help concerning the mentally ill are handled by the Fire Department Emegency Medical Services, not the police. Family members and friends who call for help want to avoid a confrontation. They are at the end of their rope, helpless and afraid. They look to EMS as saviors when they arrive to take their loved one to a hospital or psychiatric facility, only to find their options limited by law and lack of training. Patients who make the call don’t see themselves as a threat. What lucidity remained when they called for help is often gone when help arrives. These emotionally charged situations often lead to violent confrontations with would-be rescuers. Mental-health-care professionals call 911 from their facilities looking for an “ambulance” to take a problem patient off their hands. Emergency Medical Technicians are then expected to put that volatile patient into a four-by-eight-foot space filled with glass and needles. It is a recipe for disaster. EMS professionals cannot restrain, subdue or abduct. Doing so is a violation of a person’s civil rights. There are no “men in the white coats.” They don’t carry straitjackets. All they have is common sense, compassion and a willingness to help a person in need. Often, it is not enough. In the tragic aftermath of one such recent call in Pawtucket, a mentally ill man was shot and killed. The police solved the crisis the only way they saw that they could at the time. The officer justifiably felt his life in danger and responded accordingly. Would the result have been different if the fire department had been called, or would there be a dead EMT in the patient’s place? We will never know. A rapid-intervention team consisting of a psychiatrist with power to commit a patient, a law-enforcement officer with power to restrain a person against their will and a pair of EMTs to provide support and transportation in a safe environment is what is needed on these type of calls. Until that happens we are sending undertrained, unarmed and overwhelmed people into dangerous situations. There needs to be a definitive approach to handling the mentally ill who call for help. The current lack of a system is a time bomb. You can hear it ticking if you care to listen. “No police,” I said as softly as possible. “Get your things and come with us. We’ll get you some help.” I looked around for potential weapons, kitchen knives especially. A caseworker was stabbed in the neck on Broad Street a few years ago by an emotional patient and bled to death in the doorway, leaving a wife and two small children. After 15 minutes of negotiations, and her crying, laughing, and a temper tantrum or two, she left her apartment with us. From the looks of things, it may be a long time before she returns. ONE OF THE MOST important parts of a labor contract between police and fire unions and the municipalities they serve is minimum manning. There, management and labor agree on the minimum number of personnel necessary to provide adequate protection to their communities. In a true spirit of cooperation, both sides decide how best to protect their people. It is a great example of government and public-sector unions working for the common good. A minimum-manning agreement protects the populace as well as the protectors. In difficult economic times an easy fix to a politician’s bottom line is to cut staffing. These agreements prohibit that. I’m worried about the failing economy. My property taxes are already high, my paycheck barely covers the necessities and my savings and retirement funds have dwindled away to next to nothing. I haven’t had a raise in years; my employer is threatening layoffs, salary cuts, increased contributions to health care and pension cutbacks. Advancement is stagnant, bonuses don’t exist and my workload increases every day. I know I’m no different from most Rhode Islanders; these are tough times. I expect a struggle in the coming years, but I’m confident we will persevere and be better people for our struggles. What is disturbing is the lack of leadership and accountability I see from my elected leaders. Governor Carcieri announced a plan to balance the state budget that includes ending minimum-manning contractual language from arbitration proceedings for police and fire departments. I do not have a staff available to study the other provisions of the governor’s plan and offer suggestions, but I do know a thing or two about what happens on the street level. I’m a rescue lieutenant working on Rescue 1 in South Providence. I am not an expert on the subject of contractual provisions for minimum manning. I have no idea how many tax dollars could be saved if laws are changed letting mayors shift manpower, reduce staffing and close fire companies. I don’t even know what the minimum-manning level is in Providence. I do know we don’t have enough people to keep the city safe at present levels. From my seat I witness Providence’s manpower used beyond the breaking point daily. Day after day, we are forced to tap resources from surrounding communities to answer 911 calls. Crews from Cranston, East Providence, Johnston, Pawtucket and anywhere else Providence can find fill the void when we need emergency responders. The people in those communities are under-protected while their first responders are busy bailing out their neighbors in the capital. It is a recipe for disaster. Imagine your town managers wielding the power to under-staff their respective public safety departments as a cost-cutting measure. What looks good on paper loses its luster in reality. Close Fire Company A rather than staff it with overtime, shut down Rescue Company B for the night because a person was sick, deploy three patrolmen on the Southside rather than five when an officer is on vacation — whatever works is best for the bottom line, right? Wrong. Dangerously wrong. One thing that is imperative in the fire/EMS service is consistency. From our end, we need to know where our resources lie, how long before they arrive, and how many will show up when called. While I am doing CPR with my partner, I’m also formulating a plan based on my expectations. I know Engine Company 11 has been dispatched from the Reservoir Avenue Fire Station and will arrive within a few minutes with three firefighters on board. I’ll need two trained people to continue CPR, one to drive the rescue, my partner to monitor the heart, administer oxygen and start IVs. That leaves me to administer medications, defibrillate, document and contact medical control. Nobody is idle during an emergency. Often we have nobody left to drive the fire engine. We do the best we can and make due with what we have. What if the mayor closed Engine 11 for the night rather than pay overtime? What if two firefighters showed up five minutes later than planned? What chance, if any, the patient had for survival would be tossed aside because of irresponsible budgeting? Is this the best our society can do? In business, management rights are vital for operating in the most cost-efficient manner possible. In government, especially public safety, those management rights serve as a detriment to the service government is entrusted to provide. Immense pressure is put on our elected leaders. Caving in to that pressure is not something they do lightly, especially when their actions put regular citizens at risk, but it is a gamble they will be willing to take if given the opportunity. Minimum manning is not something police and fire unions hold onto to force cash-strapped municipalities to pay overtime. A properly funded and staffed organization wouldn’t need overtime to fulfill its contractual obligations. Overtime is not our incentive; the safety of our members and the public we protect is what is at stake. We are honorable people working in an honorable profession. Bad things happen to people every day, all around us. It is our job, our duty, to do our best to make things right. It takes the proper number of people to do the job properly. Who is better to say what that number is: the people on the street, or the people in the office? Public safety isn’t the fat, or gravy, or even the meat in the equation. We are the backbone holding the fabric of society together. You trust us with your lives, and we would never betray that trust. So trust me when I ask: Leave the manning levels to us! Michael Morse, of Warwick, is a lieutenant in the Providence Fire Department, a member of the Providence firefighters union and the author of Rescuing Providence. 0415 HRS. “Attention Engines 2, 7, 12, Ladders 7 and 4, Special Hazards, Rescue 3 and Battalion 3 a stillbox.” Bright light floods the fire stations at Branch Avenue, North Main Street and Admiral Street. Firefighters immediately rise from their bunks and slide the brass poles. Within 20 seconds they are dressed in their turnout gear and mounting their apparatus. Immediately, fire trucks are on their way. Hundreds of hours spent studying streets ensure there will be no mistake; the trucks will arrive in the shortest time possible. The first in companies consist of four firefighters from Engine 2 and three on Ladder 7. Code Red signals that a working fire has been found at the location. Air packs are donned, tools readied and nerves steadied. Sirens echo in the empty streets. A fire rages on the second floor of a tenement house. The first-floor tenant who discovered the fire and made the first 911 call relays information that people, a single man on the second and an elderly couple on the third, are still in the house. The driver of Engine 2 stops his vehicle 50 feet past the fire building, transfers power from the transmission to the pump, gets out of the cab and prepares to feed the attack companies the water necessary to extinguish the blaze. He opens the tank to pump valve, throttles up and gets ready for commands. Engine 2’s officer, the incident commander for now, is sizing up the fireground, planning the attack until the chief arrives and establishes Douglas Command. Strict rules will be followed: the incident command system, a nationally used method of organizing emergency responses of all sizes, must be used. The remaining two firefighters from Engine 2 stretch 250 feet of 1 3/4-inch attack line toward the rear door, knowing that it will lead to the second story stairs. The driver of the ladder truck slows down 200 feet from the fire. Utility wires, parked cars and trees obstruct his path toward the roof. The officer leaves the cab and finds a good spot to set up. There is no second chance. A wrong placement of the ladder will severely hamper the firefighting efforts. He directs the driver toward the front of the house, stopping him at the perfect location. The driver switches the truck from drive to PTO, which enables the aerial ladder to begin operations. He and the third firefighter get ready to raise the ladder to the roof. Outriggers must be lowered and secured, the ladder unlocked, then raised. One person handles the controls, the other watches the progress. The officer is at the rear of the house helping to force the door open. Once the ladder is in place, rising 55 feet between utility wires and through tree branches, the firefighters load up their tools, a quick vent saw, axes and poles, and begin to climb. Inside the house heat and gasses are accumulating, filling the space. Ventilation is imperative. Failure is not an option. The second due engine is responsible for water supply. Its crew finds the closest hydrant, 500 feet away, and stops the truck. The officer and one of the firefighters get out, take two lengths of three-inch hose from the hose bed and the hydrant dressing gear and signal the driver to go. Engine 7 rolls toward Engine 2, trailing the supply lines without which no fire will be extinguished. The firefighter at the pump expertly pulls levers and gates, and then watches as the initial 250-foot attack line fills with water and slithers toward the rear door, up the stairs into the toxic atmosphere and toward the pipe. Engine 2 carries 500 gallons of water, enough for about three minutes. The officer of Ladder 7 has located the sleeping occupant of the second floor and is helping him out of the house. The firefighters from Engine 2 man the line and hit the fire, plunging the apartment into darkness. The heat and smoke are unbearable, even to firefighters fully dressed in gear. The fire is stubborn, more water needed. The Hazards and Ladder 4 turn in their packs and enter the building. The man from the second floor is safe and in the rescue vehicle. Another rescue is called for transport. The battle rages. On the steeply pitched roof, the two firefighters from Ladder 7 straddle the peak, start the quick-vent saw that starts on the first pull — no accident; every piece of equipment is thoroughly checked daily — and begin ventilating. A proper hole needs to be 4 feet by 4 feet. The two firefighters from Engine 7 have “dressed the hydrant,” removed all three ports, attached a hydrant gate to the large-diameter opening, an extra port to one of the smaller ports and a 3-inch feeder line to the other. One waits by the hydrant, the officer starts toward Engine 2. Connections to the water supply must be made. Firefighters and possibly civilians are committed inside the burning structure. If the water supply is interrupted a successful outcome will be in doubt. Four firefighters from Engine 12 arrive. They immediately stretch another attack line from the rear of Engine 2 and start toward the rear door to back up Engine 2. The firefighter manning the hydrant receives the message and turns the spindle 14 revolutions, fully opening the valve. The feeders fill and make way toward the pump, which is beginning to cavitate, every drop from the tank gone. Just in time water supply is established. The fight goes on. With the water supply established, the crew of Engine 7 now takes another attack line from Engine 2 and enters the door toward the third floor. They fight their way up and join the crew of Ladder 4, who have just finished their primary search of the third-floor apartment. Thankfully, this time there was nobody home. The fire has spread through the walls and is now in the loft. Inside, the fire crews feel something shift and know the roof is open. The heat and smoke clear just enough to make the fight bearable. Walls and ceilings are opened by pulling the plaster with poles. Fire is found and quickly extinguished. Two members from Special Hazards are now in the basement cutting the electric supply, the other two are assisting with vertical ventilation, opening windows and doors. Once the electric supply is off ground ladders must be raised to the second and third floor windows to supply a secondary means of egress. 0500 hrs. Now the dangerous part begins. The flames are knocked down, but sparks and embers hide everywhere — inside walls, in every nook and cranny imaginable. Every remnant of fire must be extinguished or there will be a rekindle. 0556 hrs. Sunrise. The exhausted firefighters converge around Engines 7 and 2, repacking the hundreds of feet of hose. It was a good job: nobody was injured, the house damaged but saved. 0600 hrs. A man walks his dog past the firefighters. “Fire on the second floor,” somebody responds. The man stands there, looks at the house, takes in the minor damage visible from the outside, and asks smugly, “All this to put out a little fire.” He shakes his head in disdain and walks away. A MAN IN CRANSTON dies while waiting for help to arrive. His widow grieves. As days progress the questions start: Why did it take so long for help to arrive? Disaster strikes. 911 is called. Rescuers respond. Sometimes the problem is complex and takes dozens of emergency responders to rectify. Other times the emergency is handled by a single unit. Often, there is no emergency at all. When is calling 911 for a medical emergency appropriate? Most folks use their best judgment before dialing. There are certain criteria — sudden pain, weakness, injury, uncontrolled bleeding, unconsciousness or any life-threatening emergency. Highly trained and properly equipped firefighters and Emergency Medical Technicians (EMTs) are ready to respond at a moment’s notice. Our society once prided itself on rugged individualism, fairness and the ability to take care of ourselves, and our own. The tide has turned. People now expect to be taken care of. People call 911 from their cell phones while sitting in their car so they don’t have to pay for parking. They call from their homes looking for transportation, living within sight of the hospital. Doctor’s offices call 911 to have patients who are not in life-threatening condition transported to the emergency room, sometimes from the same building! Many think nothing of pushing those three buttons looking for a free ride. There is a prevailing attitude of me first, it’s free, I deserve it. Because of fear of litigation, you can call 911 for any reason and somebody will come. Nightmares. Lost dentures. Hangnails. Difficulty sleeping. Most people wouldn’t dream of such irresponsible actions. Sadly, many do. And they do it often. These calls drain our resources and leave the rest of the population without adequate protection. True emergencies happen every day. Sick, dying people must wait while rescues cater to those who refuse to help themselves. I witness the erosion of the 911 system every day. People with sore throats call 911 for a ride to the emergency room for free medical care. A person vomiting calls 911 to get free medicine. Parents of children with mild fevers call 911 so they don’t have to wait, as if their problem is more important than anybody else’s. Drunks call from their homes when they run out of booze, requesting detox. Kids fall and bump their head; rescues are called for ice packs. The City of Providence is poised to reduce its firefighting force to add additional ambulances. Calls for our Emergency Medical System (EMS) are on the rise, fires are fewer. The rationale is to move manpower from fire suppression to the rescues. What appears to be common sense is in actuality surrendering to the attitudes that can destroy our society. Somehow, our 911 system, designed to provide highly trained and equipped personnel at the scene of an emergency, has been reduced to a glorified taxi service for those who expect to be catered to. A four-man fire company is a formidable force. Each member of the company has a vital role in every response, be it securing a water supply at a fire, doing chest compressions during cardio-pulmonary resuscitation (CPR) or driving quickly and safely to your house when tragedy strikes. Compromising the integrity of that force to provide more rescues to a populace that abuses the system is a disservice to every responsible citizen. Providence residents are well protected by their firefighters. You call, we come. We come with enough manpower to get the job done, no matter what that job may be. Taxpayers pay for a service and deserve to get their money’s worth. It is a sad day when a proud, effective force must be diminished to cater to a growing population that takes government services for granted, and treats emergency vehicles as their private taxi service. I do not know the salaries of my friends in the private sector. It is not my business to scrutinize their benefit package. I do know that they work as hard as I do making a living. Some of them are doing better, some not as well. We are all getting by. The struggling economy has made us all aware of our financial vulnerability. As salaries and benefits stagnate, resentment grows. Through the ups and downs, my financial situation remains steady. For years I watched as others reaped the rewards of a strong economy. Nobody noticed or cared about my pay and benefits. My modest income paled in comparison to those in the private sector. Now, my pay and benefits are front-page news. Cities and towns are facing budget deficits: the unions are to blame. Headlines and letters scream, “The party is over! The bleeding must stop!” If I didn’t know better, I would think the state is full of impoverished workers with no benefits at all! I am a firefighter. I have a good salary, great benefits and an exciting job. I will not apologize for it or willingly give it up. Twelve years ago I was accepted into the Providence Fire Department’s 42nd Training Academy. The competition was fierce; thousands applied for a few positions. I never considered myself better than the thousands that didn’t make it. Throughout the rigorous testing procedures it was found that some of us have the potential to be better firefighters than the rest. We were hired; the others went about their lives. I know some great people that did not get hired. They are leading productive lives in other pursuits. I knew I would never get rich being a firefighter but the benefits provide my family with security. Had I not become a firefighter, I’m sure whatever vocation I chose would provide a good life for my wife and kids. I certainly wouldn’t worry about my neighbor’s paycheck. The promise of security and the nature of the job are what draw so many to apply. The public is well served by the men and women that make it through the process. If the pay and benefits were average, the pool of applicants would be smaller, and less qualified people would be responding to the calls for help from the community. I never ask thanks for the job that I do. I read and hear others in my profession justify our compensation because of our bravery. I disagree. Bravery resides in all of us. I see true courage daily. An eighty-year old woman watching quietly as CPR is performed on her husband shows real bravery. I see from glancing at the pictures on the wall images of their life together. Their kids and grandchildren are proudly displayed. The dinner dishes still dry in the sink. Two easy chairs placed in front of the television. The books and papers they have shared. She maintains her composure as we wheel him for the last time out their door and into the night. I see teenaged kids playing in the streets where their childhood friends were gunned down. They are streetwise beyond their years. They hang around and look tough. Some carry guns. They didn’t choose the life they have. They live in a world of violence and chaos. Somehow, if they are hurt, or shot, or sick and make it to the back of my rescue and we are alone, they become kids again. Nice kids too. To live in their world is brave. To visit it and help when we are called is my job. At times I bring the job home. Years of experience have provided me with ways to cope with the horrors I witness. My family knows when “something’s wrong.” Tragedy in other people’s lives has a way of making its way into ours. I try not to bring it home and mostly am successful. Unfortunately, some incidents can never be left at work and will be a part of me forever. I never know when I will be called to respond to one of these incidents. I know I can always count on my wife. She watches me walk out our door, dressed in the uniform never knowing if it will be for the last time. Too many times I have left happy and returned distant. She tells me I die a little after every shift. I think she may be right. Being a firefighters wife takes bravery, being a firefighter is our duty. I am exposed to infectious diseases on a daily basis. My body has been punished countless times battling the fires that burn throughout the city. When I retire, I will have healthcare for life. This knowledge helps when considering if the job is worth the risk. AIDS, the fear of SARS, hepatitis, TB and increasingly violent patients all contribute to my dangerous work environment. I don’t think good healthcare is too high a price for the taxpayers to bear. I am fortunate to have the greatest job in the world. I understand that there are some that are envious-the job is worthy of envy. My profession has enabled me to experience life to the fullest. To perform deeds that help lessen humanity’s suffering is priceless. I hope that the people of Providence understand what our contribution is worth. When disaster strikes, illnesses arise or accidents happen in the City of Providence help is only a 911 call away. Or is it? Far too often when a rescue is needed there is nobody to send. Providence’s six Advance Life Support Rescues simply cannot handle the volume of calls generated by the people living in and visiting Providence. Responding to an emergency in a timely fashion is critical. Tragically, here in the Renaissance City, when seconds count, help is often minutes away. Surrounding cities and towns fill the gaps in coverage with mutual aid agreements, but due to a lack of reciprocation that safety net is eroding. Each of Providence’s six advanced life support rescues handle nearly five thousand emergency calls a year, far above the national average. Cranston, East Providence, Johnston and Pawtucket routinely send their rescue crews into Providence when needed. Providence, the biggest city in Rhode Island and second largest in New England does not have the resources to repay the favor. Smithfield, Lincoln, Cumberland, Warwick, Central Falls; all send rescues to Providence. Are the taxpayers of those communities paying to subsidize Providence’s irresponsibility? What are these communities getting in return? Not much. 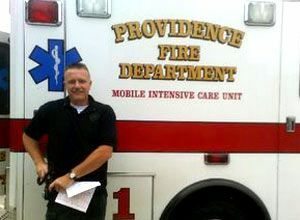 In 2006 Providence added a sixth rescue to help address the mutual aid problem. The truck operates on a temporary basis and has no assigned personnel, using overtime to fill the seats. While the number of mutual aid calls into Providence from surrounding communities did decrease slightly, it did nothing to improve working conditions, morale or number of calls responded to by the firefighters assigned to the rescue division. Most days the city’s six rescues run non-stop. Experience in the field is invaluable. You just can’t teach a person lessons learned in the street. All of the knowledge and experience doesn’t do much good if the person in possession of such life saving skills no longer serves on the rescue. The stress of the job has taken its toll on the Providence Fire Department’s Rescue Division. Qualified Rescue Officers have given up their rank, handed in their bars and left the division, leaving the positions vacant. In their place, inexperienced firefighters have volunteered as acting officers on the rescue trucks. While they have performed better than anybody has the right to expect, the loss of leadership is palpable. Morale is at an all time low, firefighters who would rather be fighting fires, some with decades of firefighting experience are sent to the rescue division to act as rescue technicians. Some crews have an acting officer with five years experience in charge of a rescue with a technician who has twenty years on the job. The calls are non-stop, the crews deal with the situation the best they can. Twelve people manning six rescues in a city of 180,000 is woefully inadequate by anybody’s standards. The dozen medics on call manage to provide Emergency Medical Services to the people of Providence in an efficient, professional manner when they are available. Their lack of availability is the issue. To drink and die on the streets of Providence cannot be how so many envisioned their future. What dreams once filled the heads of the homeless alcoholics who wander the city were replaced by cheap booze and the never ending need for more years ago. A community of lost souls exists, their plight ignored by respectable citizens who pass them by each day without a second thought. Some panhandle, some steal, some collect government benefits, they all do whatever it takes to survive. They know each other from chance meetings in homeless shelters, street corners and emergency rooms. A wary friendship exists as long as the alcohol flows. Once the bottle is empty the quest begins again; friendship forged in desperation becomes secondary to survival. These are lonely lives lived by lost souls, an existence sane people cannot imagine. Has society failed them, or have they failed society? It is a question I often ask as I transport one after another to the area emergency rooms. Time and time again the ritual is performed. Through the years I have come to know many. Cowboy, after years surviving on the streets finally found dead in a dumpster. Sivine, a Vietnamese refuge who dined in the trash cans that line Broad Street dead in a field. Armand lost his frostbitten fingers one year, his toes another. He liked to sleep under the stars after a night of drinking. They found his body floating next to the pier near the hurricane barrier. Russell, a living corpse survives on the streets by using Rhode Island Hospital as his personal hotel and the Providence Fire Department his taxi service. Curtis stayed sober for a year or so but has returned, drinking with a vengeance. Debra manages to put on her make-up at the shelter every morning; by afternoon she is drunk again, her tears leaving black trails down her cheeks, urine soaking her clothes. Chris has been missing for a while. I wonder if he is dead, sober or waiting to make his triumphant return. John has been sober for years now. I see him from time to time. He is pleasant, a little reserved but sober. His drinking career ended the night he drank furniture polish looking for more when the booze ran dry. His friends let him do it and laughed when we took him away, comatose. There are many, many more. Desperate people do desperate things. There is a lot of desperation lurking beneath the polished surface of the Renaissance City. Why are these people allowed to roam the streets? Their behavior is habitual, suicidal and reprehensible. Every day the emergency rooms treat the regulars. Russell alone has cost the hospitals, state and federal government millions of dollars during his drinking career. He takes from society and gives nothing in return. The combined cost caring for these individuals is astonishing. The homeless alcoholics drink until they can drink no more, then either they or a concerned citizen calls 911 for help and a rescue is sent. Nearby true medical emergencies occur, the victims wait for help while a drunken person is given a ride to the hospital to sleep it off. Day after day, night after night they call. There is no rehabilitation. There is no cure. There is no easy answer. Who is responsible for this disgraceful situation? I am a guilty part of the machine allowing this debacle to continue. It is easier for me to put them in the rescue and dump them off at the hospital than to drive away and leave them to suffer the consequences of their actions. I have no intention of risking my livelihood if one of them were injured or died as a result of their self inflicted condition. The hospitals are also guilty. Day after day the patients are treated and released. The game is played over and over and has been for years. The Department of Health shares the blame. It is easier to maintain the status quo than develop a plan that will cure them or have them committed. The police department is also complicit. Why aren't the repeat offenders arrested for being drunk and disorderly or public drinking? Social services such as Crossroads try to help but simply cannot be held responsible for the actions of those who will not help themselves. The fact that the drinking is funded largely by taxpayer money is another disgrace. Disability payments for alcoholic behavior fuel the very fires that caused the disability. Giving cash to people who have proven again and again that they are incapable of handling the responsibility is insanity. I wrote the above a few months ago and submitted it to the Providence Journal. I made sure that six of the papers most popular columnists received a copy. Since then, Debra died, nobody claimed her body. Today, I found out that Russell is comatose at Rhode Island Hospital in critical condition. He had a seizure , fell and smashed his head on the sidewalk he calls home. More lost souls have taken their place on the streets. I’ve never heard from any of the social commentators from the Journal, their stories apparently not worth the cost of the ink needed to print them. Editor's note: EMS1 invited all EMS providers from across the nation to submit a short, original story for the second annual Excellence in EMS Award contest – and we're delighted to announce the winner. Michael Morse, an 18-year veteran, is a Firefighter-EMT in Providence, Rhode Island. His article, 'Here,' was chosen by judges as the 2009 winner from the many entries submitted. We'd like to thank everyone who submitted articles, and you can see a selection of some of the best entries on our special Excellence in EMS Award page. The neighborhood where I spend much of my life appears at first look to be located in another country. The color of my skin makes it impossible for me to "fit in." My uniform allows me to mix freely with the people here. I am an ambassador, representing not only the Emergency Medical Division of the Providence Fire Department, but generations of immigrants as well. People here look to us at their darkest hour. We respond, treat them with dignity and respect, and show them what makes America and the fire service great. Regardless of income, race, religious or sexual preference, we respond. Our uniforms are not symbols of oppressive regimes, rather a beacon of hope in a sometimes frightening world. Years ago I began working in this area. I have seen many changes. At first I felt like an outsider, it was obvious that I didn't belong. I was treated differently from the people who lived in the neighborhood. They seemed to tolerate my presence, but patiently waited for me to go. Whether these thoughts were real or imagined, I will never know. I do know that I no longer feel that way. We have both changed, the neighborhood more diverse, myself accepting the way of the people who live and work here. Time has marched on and we have learned from and accepted our differences. Riding through the neighborhood, I marvel at the businesses that have replaced the abandoned buildings. Restaurants and grocery stores, beauty parlors, barbershops, nightclubs, delis, and boutiques are some examples of what the main street has to offer. Some mornings I see sidewalks being swept by proud business owners. In the afternoons, shoppers fill the streets and stores. There are sidewalk vendors, food carts and kids running everywhere. On weekend nights the dance clubs are full of people partying. They come from all over. The hardworking people out for a night of fun outnumber those looking for fights and trouble. Hope abounds. As wealthy families deserted the inner city, poverty replaced prosperity. It took decades but economic forces drove the beautiful streets toward despair. When I first started working this community, it was a dangerous place. The people on the street were to be avoided. Crime was prevalent, hopelessness evident in the look on the people who lived here. Unfortunately, that element still exists. The difference is they are now the minority. People are free to go about their business with less trepidation. Danger lurks, but the cowards that prey on the ambitious have been forced into hiding. The good people outnumber the bad. I enjoy thinking about the past and future. I spend a lot of time driving through the different neighborhoods in this city. I look at the buildings and people, thinking of what was and what is to become. My great grandparents came to this country from Sweden and Ireland. They settled in the area, some worked as carpenters and helped build a lot of the homes that line these streets. They raised their families through tough times, but never lost their hope or drive. Their hard work set the foundation for future generations. I will always be inspired by and thankful for their sacrifice. The streets where my family began and I now work have endured. The prestige once taken for granted here is slowly returning as people gain a sense of place, pride and roots. The members of the Providence Fire Department work here, shop here and live here. Our families started their legacy generations ago here. Right here. And here we will be generations from now. It is an enormous responsibility entrusted to us every time we put on the uniform. We represent honesty, competence, fairness and stability. We have been, and always will be part of this place, holding strong during times of strife, standing proud in times of prosperity and forever keeping the people who live here safe. I grew up in a union household. My father belonged to the IBEW until he was promoted and took a job in management, taking with him the morality and ethics of his union membership. I remember my uncle, Bill, proudly wearing his Teamsters cap. Uncle Ron was a Warwick cop. Brian was president of his union at Rhode Island College. We would spend summer days at their homes, surrounded by family, the American flag always flying, either on a flagpole or attached to the house, the red, white, and blue flew proudly. Modest homes meticulously kept, hard work, and an ability to enjoy the fruits of their labor and share them with friends and family was all they wanted. Uncle Bill was a WWII vet, my father a Navy signal man during the Korean War. Brian served in the Air Force during the Viet Nam War. They lived, and live, good, honest lives, are fiercely proud of their country, and fought for the freedoms we now enjoy. Union members. Not everybody in my family, but those I remember most. My brother, Bob, just returned from Iraq. 500 days. Another union man. Myself, a firefighter in Providence. Union. We are living in the shadow of our uncles and father, and it is my belief we have made them proud. Some of our union leaders have let us down, just as some of our elected officials have let us down. Politics is a cutthroat business, and like it or not, everything is political. Those that have risen to the top of our ranks thrive in that arena; most of us would rather do our jobs, do them well, and live our lives. We need people in positions of power for us to do that. Relentless media attacks have insulated the union ranks. An us-against-them attitude prevails. Gone are the days when a union worked with management in a respectful, productive atmosphere. Maybe that never existed; I don’t know. "Gold Plated Benefits, Feeding at the Public Trough, Picking Our Pockets," and on and on. "Socialists, communists, serving the weak, protecting the incompetent…," enough already. Maybe you grew up in a different world. Judging from some commentary here, you don't have a clue about mine. He’s eighty-five and thinks his days are numbered. He felt the same way back in ’43. I had to pick my chin off the floor when he told us about the German Luger that was missing when he returned from a ten day “kind of” unauthorized tour of Rome. “Where did you get a Luger?” I asked, off camera. “Off the German I captured,” he said as if ordering a pizza. Dennis and I exchanged glances, both of us knowing something special was taking place. We knew Uncle Tony was a World War II Veteran and hoped to talk him into telling his story on camera. Until this day any questions we asked were quickly dismissed. The subject would change and Tony seemed happy to be out of the spotlight. We are running out of WWII Veterans. Soon there will be nobody left to tell the story. Watching old footage or a reenactment of the War staves our thirst for knowledge but will never fully quench it. Dennis’s and my fascination with the war and the people who fought it has a lot to do with our age; Dennis’s dad was a World War II veteran, my father served in Korea. When we reached an age where our dads might confide in us, tell us what it was really like, man to man, it was too late, they were gone. Will our children, and then their children know and appreciate the bravery and sacrifice made by the people of that era? Without a link to the people who were on the ground at Anzio, Palermo, The Po Valley, Normandy, Iwo Jima and everywhere the war was fought, even the factories at home where wives and mothers worked will they care? Dennis decided that they would care. Our kids know and love Uncle Tony, the funny, generous “old man” who shows up on holidays and family functions. They don’t know the nineteen-year-old soldier who earned a Bronze Star by crawling through the battlefields of Italy establishing communications between the front lines and the artillery. As the interview progressed, I found that neither did we. “Did you wait until the next day when the shelling stopped?” I asked. He tilted his head and grinned. I saw the fearless nineteen year old in his eyes then as he described running in front of the artillery to repair the broken lines. “We went at night, followed the lines until they came to an end. “You shouldn’t be alive,” said Dennis. A peaceful silence filled the room as we absorbed the enormity of what Uncle Tony survived. “How did you capture the German?” I asked, not wanting to change the subject but afraid this “small” task might be overlooked. What started as a tense interview was now three guys in a room, one telling stories, two listening. Uncle Tony relaxed knowing his audience was putty in his hands. We would have listened all night. The camera rolled. The footage will be part of our family for generations, maybe forever. “You captured a motorcycle?” Dennis asked, completely charmed. Dennis and I sat back, speechless as the living history seated with us told his story. “I was a little different then,” he said, his eighty-five year old eyes sparkling like I imagined they did when he commandeered a Luger and a motorcycle from a German officer in 1944. Ten days later, after some “crazy times,” Uncle Tony returned to his base to find his unit had shipped out and his duffel bag was missing, along with the Luger. “What could I say, I was late,” he smiled. Every day since I’ve been thankful that we weren’t late, and managed to get Uncle Tony’s story recorded. When the interview ended after about an hour and a half we met our wives and kids at a nearby restaurant. Tony took us out to dinner. We talked, told stories and laughed the entire time. Tony sat next to his wife of sixty years, Auntie Rose and joined in the lively conversation. He didn’t say a word about the war. You cann’t believe simply how so much time I had spent for this information!